In a further turnaround, solicitors acting for npower have stated that it was never their intention to stop legitimate reporting of the protests surrounding npower’s controversial ash dumping at Radley Lakes, Oxfordshire. However, EPUK understands that just three weeks ago, the same solicitors emailed the editor of the Oxford Mail advising him that the injunction would directly affect both what photographs could be taken and published by his own photographers. The apparent change in position by npower’s solicitors Lawson-Cruttenden puts them embarassingly at odds with the energy giant’s own press office. However, a spokesperson for npower yesterday maintained that the injunction still prohibited all photography of its employees and contractors, regardless of whether it was legitimate news reporting. When told that correspondence obtained by EPUK showed that their own solicitors concurred with the judge on this matter, the spokesperson said: “I’ll have to get back to you on that”. At the time of going to press, npower had not replied further. They list their involvement in high profile cases, such as those campaigns where protests have been carried out by animal-rights extremists. These include Newchurch Guinea Pigs, during which the remains of a relative of the site owners was allegedly disinterred up and hidden; the Oxford lab protests, where some of the known protesters had convictions for terrorism offences, and Huntington Life Sciences, where the harassment included death threats and fake bombs being sent to workers. By comparison, the most serious allegation presented to the court to support the npower injunction said that a security guards was hit on the leg by a van driven by a protester, although a separate statement records that the protester involved disputes this. In any case, the security guard told the court in his statement that there was no bruising on the leg afterwards. Unlike the above three campaigns, none of the principal six named individuals named on the injunction appear to have any involvement with any extremist groups. They included a vicar, and a 67 year old physician. Most surprisingly, npower’s solicitors have agreed with Justice Calvert-Smith that EPUK member Adrian Arbib should never have been served with an injunction. In correspondence obtained by EPUK, they say he was served in what they describe as “an abundance of caution”. At the time, Arbib was only the second person to have been served with the injunction. They go on to add “When he was served, it was not clear to the injunction servers who he was”, with the implication that had they known he was a legitimate member of the press, he would not have been presented with the injunction. However in the video shot by Arbib at the time, a version of which can be seen at Sqweegee’s blog he can seen and heard clearly identifying himself as a member of the press as the injunction is served. 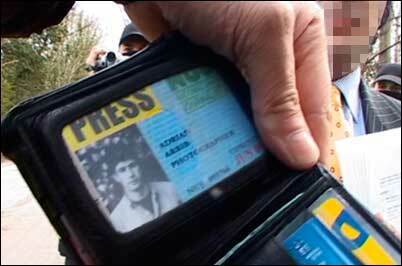 He can be heard telling the solicitors “Excuse me, I’m a member of the press…does that count for anything ?” . The solicitor replies: “I refer you to the terms of the injunction”. After seeing a copy of Arbib’s NUJ-issued national press card. the solicitor attempts to cover up the lens of the video camera, saying: “You have been served with a copy of the injunction. You cannot take any more photographs of me”. The revelations come in the week where npower has faced its most damaging publicity, with the story being picked up by national newspapers. Last week, the Oxford Mail reported on allegations that npower contractors had deliberately destroyed a swan’s nest at the beauty spot. A point that has been missed here is that the lone protestor camped outside Sandles until Feb 14 was being far more harassed by the security guards than they could ever have been by him. He alleged that the guards had threatened to pee in his water while he was asleep, and that they had referred to him as an ‘animal’ that should not be fed. The big difference was that he did not have access to smart-arse lawyers, high court judges and a private police force. The asymmetry in the law as was applied in this instance is staggering. Following his detention and arrest, that protestor nearly ended up dead, and sustained very serious injury likely to result in permanent disablement. That is the price he paid simply for wanting to save what he believed to be a piece of natural landscape worth protecting. Hi. A couple of intresting snippets. I understand that Npower did not have permission from the Forestry Commission to kill all the trees and the County Council have admitted that they only granted planning permission because they were frightened of being sued if they refused it. Ironically, they had every basis in law in which to refuse it previously but would most definitely lay themselves open to legal action now if they withdrew it. Corruption and incompetance on the part of Oxfordshire CC is the reason why matters have got this far. Luckily the press have got proper wind of the situation and Npower are seriously on the back foot. We may yet beat the vile bastards. While Judge Calvert-Smith has unequivocally stated that the injunction is not intended to prevent journalism npower’s lawyers have decided that they need to reinterpret that in the most obnoxiously arrogant way possible. - media possessing a business card demonstrating affiliation to an official media organisation verifiable by telephone call. This is provided the Accredited Media comply with the numbered conditions below. 1	Accredited Media to inform RWE Npower In advance of attendance at Radley Lakes (5$ defined In the Injunction), The prior notification should be given to RWE Npower’s press telephone (0845 020 2607). photograph or video in r around Radley Lakes. property (as defined in the injunction). 5	In the event of Accredited Media capturing photographic and/or video images of employees, agents or contractors of RW npower that may, on their own or as part of a series of published images, lead to the disclosure of their identities, these images shall not be published in any form. Clearly npower feel that they, and only they, can decide which of their objectionable practices may be covered by the press. And where is the NUJ in all this? Good question. NPower now think they can make the Law as well as Break it. Cutting down trees without a Forestry Commission Licence, harrassing wildlife, destroying nesting habitats, trying to scare off protesters with their Injunction. Then, when they realise the mess they have got themselves into, they decide they didn’t mean to include Journalists and Professional Photographers in the injunction, but they did. Only The High Court can vary the injunction, upon application. It is not within NPowers remit to do so. Perhaps they are the ones who are now in Contempt of Court and should be prosecuted! Npower have shown themselves to be what they really are. Corporate Bullies with no conscience. I hope everyone has been to the Govt Website petitions.pm.gov.uk/SaveRadleyLakes to vote.